Fungi belonging to the genera Trichoderma and Gliocladium are soil- bourne saprophytes which have been used for industrial and agricultural applications for decades. Some strains produce enzymes and antibiotics while others are useful as biological agents for the protection of plants against pathogens. 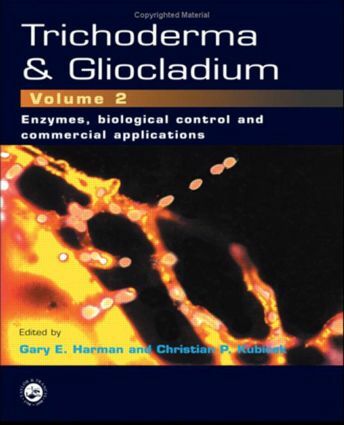 This second volume of two describes the commercial uses of Trichoderma and Gliocladium, beginning with an in depth discussion of the degradation of polysaccharides and macromolecules by fungal enzymes. The application of the fungi in biocontrol for agricultural purposes is then examined. The final section of this volume deals with protein production and the utilisation of Trichoderma enzymes by various industries. 1. Structure -function Relationships in Trichoderma Cellulolytic Enzymes A. Koivula, M. Linder and T. Teeri 2. Enzymology of Hermicellulose Degradation P. Biely and M. Tenkanen 3. Regulation of production of plant Polysacharide Degrading Enzymes by Trichoderma C. Kubicek and M. Penttila 4. Chitinolytic Enzymes and Their Genes M. Lorito 5. Glucanolytic and Other Enzymes and Their Genes T. Benitez, C. Limon, J. Delgado-Jarana and M. Rey 6. Trichoderma and Gliocladium in Biological Control: an Overview L. Hjeljord and A. Tronsmo 7. Mycoparasitism and Lytic Enzymes I. Chet, N. Benhamou and S.Haran 8. The Role of Antibiosis in Biocontrol C. Howell 9. Direct Effects of Trichoderma and Glicocladium on Plant Growth and Resistance to Pathogens B. Bailey and R. Lumsden 10. Industrial Production of Active Propagules of Trichoderma for Agricultural Uses E. Agosin and J. Aguilera 11. Potential and Existing Uses of Trichoderma for Agricultural Uses G. Harman and T. Bjorkman 12. Trichoderma as a Weed Mould or Pathogen in Mushroom Cultivation D. Seaby 13. Industrial Mutants and Recombinant Strains of Trichoderma reesei A. Mantyla, M. Paloheimo and P. Suominen 14. Application of Trichoderma Enzymes in the Textile Industry Y. Galante, A De Conti and R. Monteverdi 15. Application of Trichoderma Enzymes in the Food and Feed Industries Y. Galante, A De Conti and R. Monteverdi 16. Applications of Trichoderma reesei Enzymes in the Pulp and Paper Industry J. Buchert, T. Okansen, J. Pere, M. Siika-aho, A. Suurnakki and L. Viikari 17. Heterologous Protein Production in Trichoderma M. Penttila J. Aguilera, Pontificia Universidad Catolica de Chile, B. Bailey, USDA, USA, N. Benhamou, Universite Laval, Canada, T. Benitez, Universidad de Sevilla, Spain, P. Biely, Slovak Academy of Sciences, Slovakia, T. Bjorkman, Cornell University, USA, J. Buchert, VTT Biotechnology and Food Research, Finland, I. Chet, The Hebrew University of Jerusalem, Israel, A De Conti, Lamberti, Italy, J. Delgado-Jarana, Universidad de Sevilla, Spain, Y. Galante, Lamberti, Italy, S.Haran, The Hebrew University of Jerusalem, Israel, G. Harman, Cornell University, USA, L. Hjeljord, Agricultural University of Norway, C. Howell, USDA-ARS, USA, A. Koivula, VTT Biotechnology and Food Research, Finland, C. Kubicek, Institut fur Biochemische Technologie und Mikrobiologie, Austria, M. Linder, VTT Biotechnology and Food Research, Finland, M. Lorito, Universita degli Studi di Napoli, Italy, C. Limon, Universidad de Sevilla, Spain, R. Lumsden, USDA-ARS, USA, A. Mantyla, Rohm Enzyme Finland Oy, Finland, R. Monteverdi, Lamberti, Italy, T. Okansen, VTT Biotechnology and Food Research, Finland, M. Paloheimo, Roal Oy, Finland, M. Penttila, VTT Biotechnology and Food Research, Finland, J. Pere, VTT Biotechnology and Food Research, Finland, M. Rey, Universidad de Sevilla, Spain, D. Seaby, Department of Agriculture for Northern Ireland, M. Siika-aho, VTT Biotechnology and Food Research, Finland, P. Suominen, Roal Oy, Finland, A. Suurnakki, VTT Biotechnology and Food Research, Finland, T. Teeri, VTT Biotechnology and Food Research, Finland, M. Tenkanen, VTT Biotechnology and Food Research, Finland, A. Tronsmo, Agricultural University of Norway, L. Viikari, VTT Biotechnology and Food Research, Finland.